Peanut Sauce marinated chicken and tofu summer rolls, yummo. One of my very favorite things to eat is anything in a “summer roll” – a very thin rice paper that you soak briefly in hot water to make it pliable, and then quickly wrap any fillings in it like a little asian burrito. When I lived in Colorado, there was this amazing asian restaurant that would serve this tofu summer roll with this incredible peanut dipping sauce. I tried a bunch of recipes to duplicate this sauce, but ultimately landed on one you can just buy in the store. It’s delicious, and for someone who has a real aversion to anything spicy, but is marrying someone who would eat spice every day, it has enough heat to create a solid middle ground for both of us. Working with rice paper is pretty fun once you get the hang of it – the key is to work quickly, and not overstuff it, since the paper is really thin (ummm…because it’s made of rice grains. You get the picture). I marinate both tofu and chicken in the peanut sauce, since some people still think “protein” only means “meat”. As a side note, it’s really important to get organic tofu and check that it’s a brand that contains no GMOs (Genetically Modified Organisms), as soy GMOs are especially bad for you. 1. After tofu is drained, cut into 1/4 in. strips and cover with Peanut Sauce, marinate for 2 hours to overnight. These slices also make an amazing snack. –As a side note, my favorite story about vegans and tofu. When I lived in Boulder, there was a “local interest” story all over the news about a vegan who wanted to personalize her license plate by letting people know about her love of all things soy. The Colorado DMV wouldn’t approve her suggested license plate because they were concerned “ILUVTOFU” could have a more suggestive translation than, you know, “I luv tofu”. 2. Marinate the chicken strips in the peanut sauce as well. 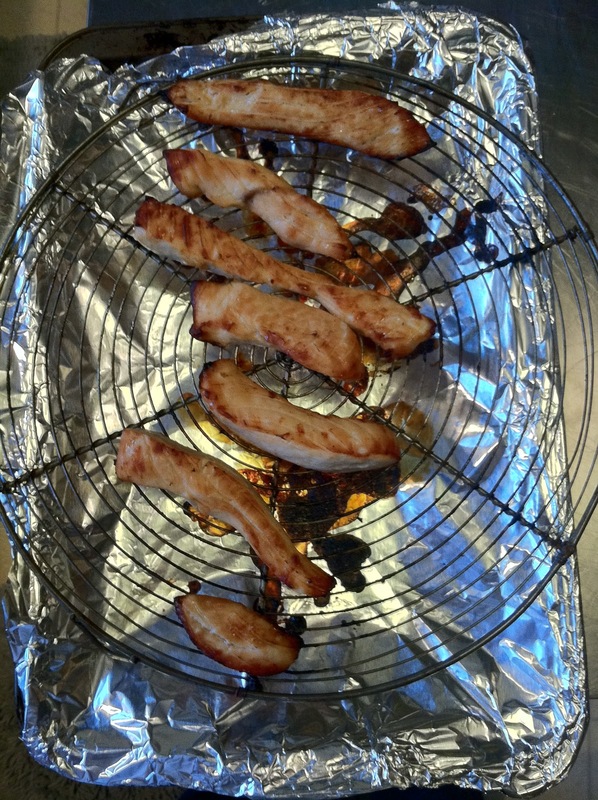 When ready to cook, line a roasting pan with aluminum foil, and put a cooling rack over it. Place the marinated chicken strips on the cooling rack and cook in the oven under the broiler for 3-4 minutes per side, depending on thickness. I love this little roasting pan/cooling rack technique of cooking chicken, since it basically creates a convection oven type of environment, and covers both sides of the meat way better than something lying flat against a cooking tray. 3. 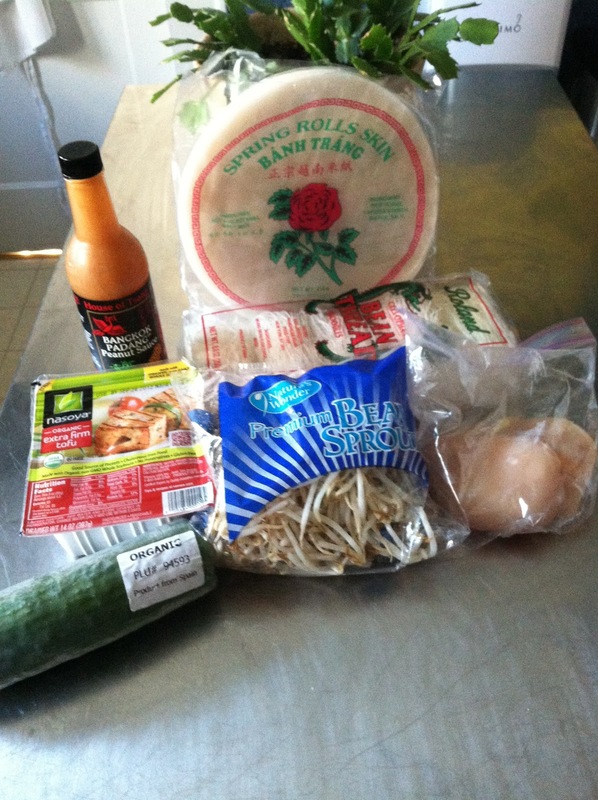 Cook bean thread noodles according to package – this should take approx. 2 minutes in total once the water is boiling. 3. Arrange your little “assembly station”. 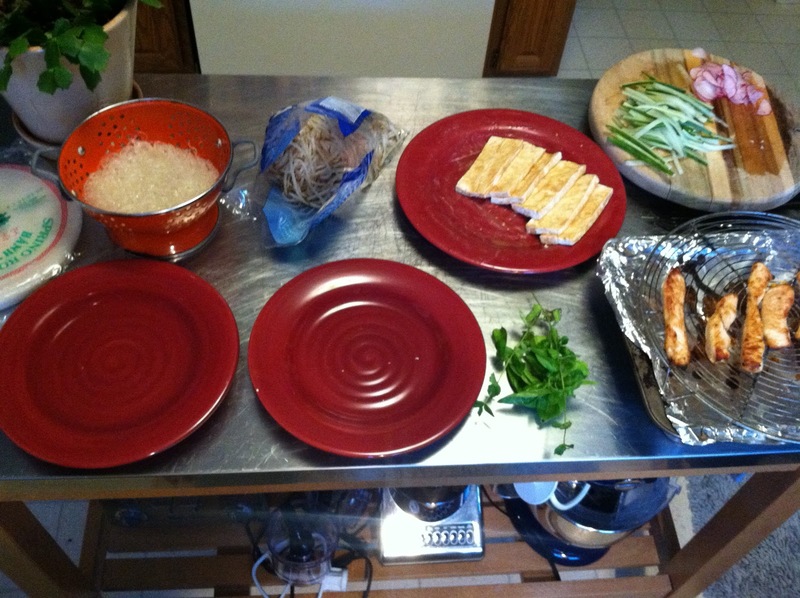 You want to have a wide, flat bowl full of hot water, a plate for assembly of the summer rolls, your cooked bean thread noodles, the marinated tofu, the marinated, cooked chicken, the basil/mint, bean sprouts, and julienned cucumber (and carrots, if you’re doing that). 4. 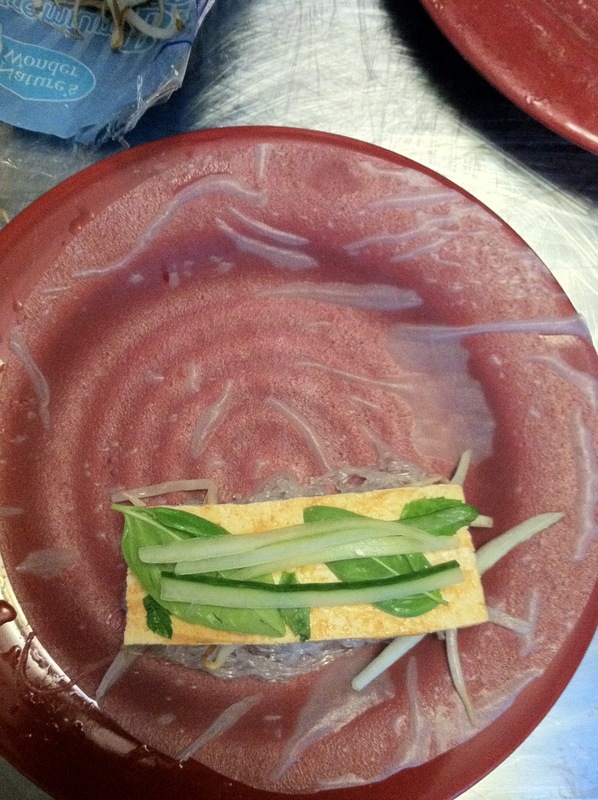 Working quickly, dip rice paper in hot water until soft and pliable (approx. 30 seconds). It will become translucent when ready to use. 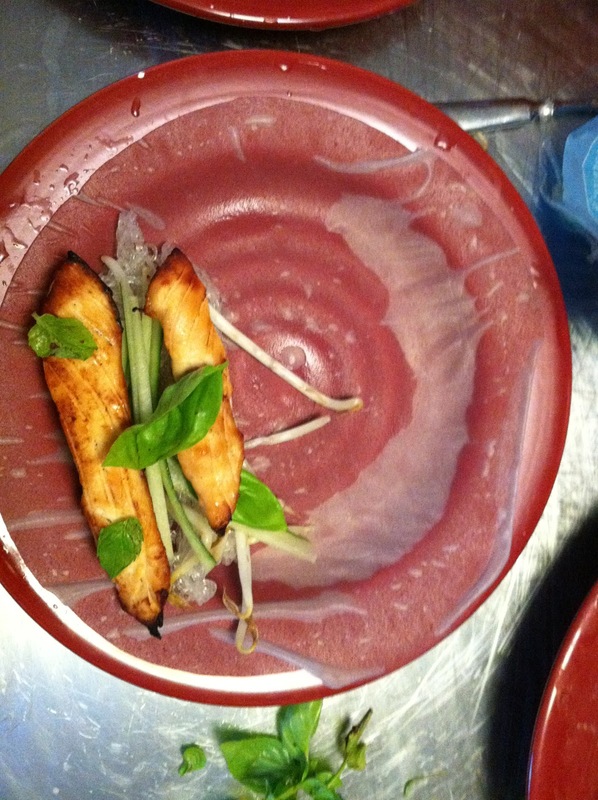 Put rice paper onto a plate and add noodles, tofu or chicken, bean sprouts, basil, mint, cucumber. 5. Starting from the bottom, roll up like a burrito.Be careful not to overstuff the rice paper. This took me a couple of tries to get the hang of it, but they turn out so well once you do! 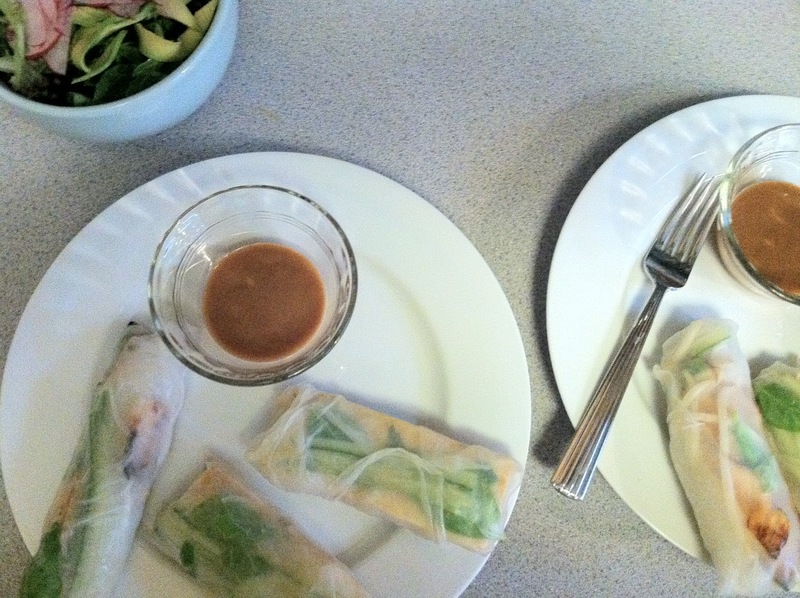 Arrange summer rolls on a plate, making sure they don’t touch (they will stick together). 6. Serve with a side of peanut dipping sauce and a delicious salad. This entry was posted in chicken, House of Tsang, ILUVTOFU, Nasoya, peanut sauce, summer rolls, tofu, Wegman's on September 6, 2012 by westyn.